I have decided that if heaven exists, it should be a lot like The Homestead. The Homestead is a resort that sits nestled among the Appalachians in Hot Springs, Virginia. It is in fact a very old resort. The first building for visitors was constructed near the hot springs in 1766, when we were not even a nation. In 1766, it was more like a fancy hunting lodge. In the intervening two hundred plus years, the resort has grown. It now caters to skiers, conventioneers looking for an unusual place to congregate and people with lots of money and leisure. For the rest of us, if we have some money burning a hole in our pockets, we can escape for a few days and live the life of the British aristocracy. One thing is for sure, The Homestead is not an inexpensive place to visit, even during off-season. My wife and I just returned from spending two nights at The Homestead. The first few days of March are as empty as The Homestead probably ever gets. I would be surprised if ten percent of its eight hundred plus rooms were full. It turned out the dearth of people was something of a blessing, as the place is often packed during prime season and on the weekends. If you need a massage or even two, chances are you can be worked in without much problem during the first week of March. Nevertheless, do bring plenty of money because maintaining the high quality of the resort does not come cheap. Over two centuries the resort has metastasized, in a good way. It’s sort of like being on a cruise ship, except the meals and most activities are not free. At least you do not have to worry about becoming seasick. There seems like a million things you can do at The Homestead, and most of them cost extra and include spending the day in the spa, having the kinks worked out of your muscles, skiing, falconry or playing golf. Perhaps the best thing to do is simply relax. 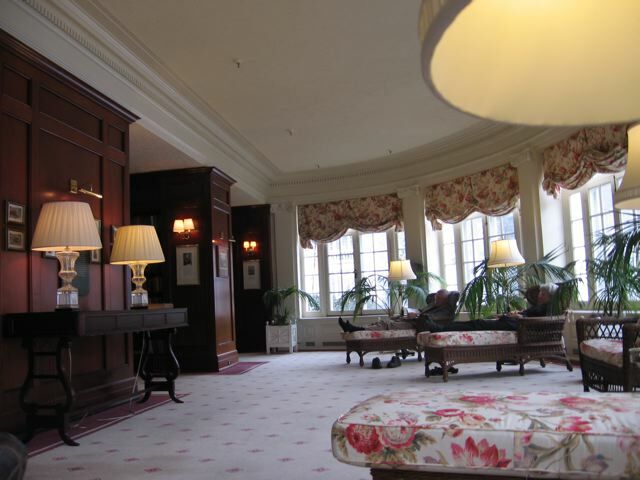 A good place to relax is in The George Washington Room where, if so inclined, you can browse through an eclectic selection of books housed in cherry wood cabinets or play chess or checkers. Based on my experience, it is an excellent place to stretch out in a chaise lounge and snooze for an hour or two. Moreover, you won’t have to worry about CNN or Fox News playing on a nearby television to disturb your slumbers. 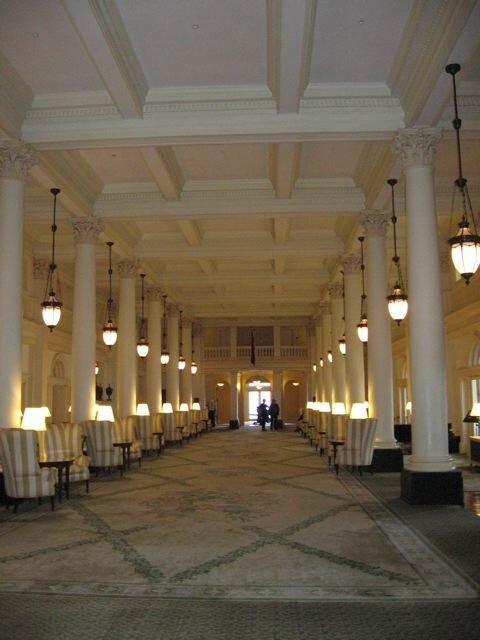 The Great Hall, the main entrance to the hotel, is truly grand. It comes with sixteen-foot ceilings, roman columns and plenty of comfortable chairs that invite intimate conversation. On cold days you can sit next to one of the many fireplaces, feel their heat and hear the wood crackle. Some of the more nerdy bring their laptops. At least in March, as a gentle wet snow fell outside, the Great Hall invited only peaceful contemplation. The Great Hall becomes a bit grander between three and four in the afternoon. This is tea time. A pianist sits down at the grand piano while waiters and waitresses (in black uniforms, of course) ask you very politely if you would like tea. A few minutes later, they return with a large silver tray laden with tea and tea biscuits, which you can sip like a proper British aristocrat, adding cream and a dash of lemon if you prefer. With only two nights and with winter weather making most outdoor activities inadvisable, we spent most of our time indoors. Getting anywhere was an adventure because you have to traverse numerous long hallways and staircases. This resort is not for the vertically challenged, although there are elevators you can take if needed. In early March, the hallways were mostly eerily silent. However, we did eventually find the spa (where my wife enjoyed a Swedish massage), the exercise room (where I spent two hours working out), the bowling alley (where we played pool and I lost twice), the movie theater (showing mostly G-rated family films) as well as many other rooms and alcoves that range from ornate to intimate. In them you could relax, look at old paintings on the wall, or lapse into a comfy chair. Dark paneling is de rigueur at The Homestead. Overall, the standards are quite high at The Homestead. Most rooms are standard size but some suites are available. Our room came with an exceptionally comfortable king sized bed and a very large flat panel television on which standard definition cable channels looked somewhat stretched and silly. Perhaps the high definition channels will show up in time. Regardless, we rarely have slept so well in a hotel bed, but our sleep was also enhanced by the relatively few hotel occupants. For the most part, the hotel is an example of how well you can preserve and modernize a massive but aged resort if you spend enough money and can give it enough attention. Clearly, there is no lack of money at this resort. The only mystery is how they keep the place so immaculate. I imagine the cleaning crew mostly works only at night because they were certainly absent during the day. Unsurprisingly, you will find excellent dining at The Homestead. You had best bring some fancy duds with you, because they won’t let just anyone into The Dining Room for dinner. Gentlemen are expected to wear shoes, a collared shirt and a sport coat or suit. Don’t expect a salad bar, but you can order salad as a second course if you prefer. Do expect to find the staff impeccably groomed, a three-piece band playing button down music (show tunes were popular last night) and modestly sized entrees of very high quality. For those with looser feet than mine, there is also a modest-sized dance floor to enjoy. Breakfast in the same room is much less formal and more pedestrian, with a large breakfast bar full of the foods you crave. Even with all the usual temptations like eggs and hash browns, I found the fresh fruit alone to have been worth the $25 cost of the meal. The taste of this morning’s fresh strawberries, pineapple and blueberries still linger on my tongue. We could have easily spent a week at The Homestead, but we are not yet independently wealthy. Between the wonderful but expensive meals, extras like massages, various resort packages you can choose from, the dubious “activity fee” and the room rate, a couple can spend $500 a day without any problem, and it is easy to spend considerably more. However, if you have the money, you should feel no qualms about spending it because The Homestead offers no compromises in providing a first class resort experience. While the money holds out, you can buy yourself the sort of lifestyle you have always wanted but could not quite afford. The Homestead has hosted over twenty presidents as well as celebrities that seem countless (many of whom can be found in pictures on the limitless walls), but also has its dark side. Most recently, on March 21, 2009, Beacher F. Hackney, a resort employee, allegedly shot and killed two of his supervisors. He is currently #1 on America’s Most Wanted fugitives and is still at large. We would have liked to have more time to spend at The Homestead, but this short mini-vacation amounted to a quick getaway to reconnect and de-stress. We look forward to a return trip as soon as our bank account recovers.